Well this post is long overdue, apologies for that. So, thought I will keep it sweet and simple. Although it may seem technical, it is quiet amateur baker proof but it will surely impress all your guest. This is my take on the classic Mexican dessert “Choco-flan”. For this recipe I used a 12 inch bundt pan. The first thing you need to do is grease the bundt pan with butter and flour it. If any of you are familiar with making caramel custard, then this stage is the same. In a saucepan, put the sugar and water. Now step away and let it do its thing. DO NOT touch it, I always get tempted to stir it but if you do, it will crystalize. Saying that, make sure not to walk away because caramel is something that can burn in a blink of a moment. Once it starts looking like a river of gold, move it from the stove immediately, pour it onto the base of the bundt pan, cover it with cling film and put it in the fridge. If you have done this right then to be honest you have just conquered the most technical part of the whole recipe. Use an electric hand whisk to the sugar and butter until it turns into a smooth and creamy batter. Crack in 2 eggs and beat it on medium speed. Then add half of the flour and mix it in well. Crack in the final 2 eggs and finally the last bit of flour. You are going to be left with a rich and chocolatey batter, to this add the brewed coffee and vanilla essence. The good part about this is that you can use the recipe for a basic chocolate cake too. Now that you have made the cake batter take the bundt pan out of the fridge and pour the batter over the caramel base and keep it aside. This is the easiest part. 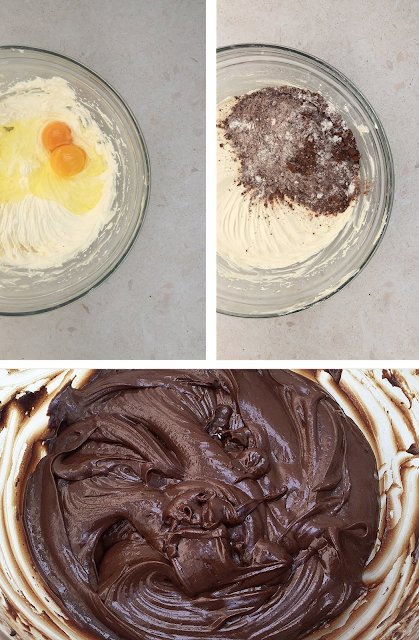 Put all the ingredients into a blow and use a whisk to mix it all really well. Yeah you are done, told you it was going to be easy. Now pour it over the cake batter. Cover it with foil and bake it for 1 hour and 15 minutes at 185*C. When you do, make sure to keep a tray of hot water on the rack under.I am not entirely sure about the science behind it, but while baking the flan mix sinks to the bottom and the cake ends up on top. That is the what the end result should look like. After 1 hour and 15 minutes put a toothpick into the cake, if it comes out clean then it is time to take it out. If not, then keep it in for another 3-5 minutes and that should do the trick. Once you take it out, let it cool. This is probably the hardest part of it all and I cannot stress this enough! But seriously you need to let it cool down properly. I would say give it at least 2 hours. The first time I made this, I was in such a hurry that I flipped it out of the bundt pan and it fell apart. Do you remember the technical skill you learned few minutes ago, on how to make caramel? That is now going to come in handy, follow the process of the caramel base. Now you need to let it go slightly darker this time, once it does move it from the stove and whisk in cream and add the vanilla essence. I like to make this last because by the time the cake cools down, the sauce will be warm. After couple of hours, the wait is finally over! Use a butter knife and go around the edge of the pan,put a plate (bigger than the pan) or a wooden board over the bundt pan and flip it. Pour the warm sauce over it, cut yourself a piece, sit back, relax and enjoy. If you try this recipe please do share it with me, I would love to see your take on this sweet treat. Tag me on Facebook and Instagram @misstgeorge, also use the hashtag #misstgeorge and don’t forget to hit the like button on my social media pages for more updates and recipes.